A recording of a live tele-seminar. 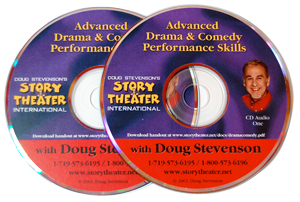 This 2-CD program is a supplement to the Story Theater Six Pack with more acting skills that you can apply to your stories. Guided exercises help you to make your stories more visual, dramatic and funny. Learn how to SHOW and TELL your story rather than just narrate it. This program focuses on performance. An AMAZING performance doesn’t come from content alone; it comes from the combination of content, technique and passion. Are you ready to move up to the next level? This audio program will take you there.